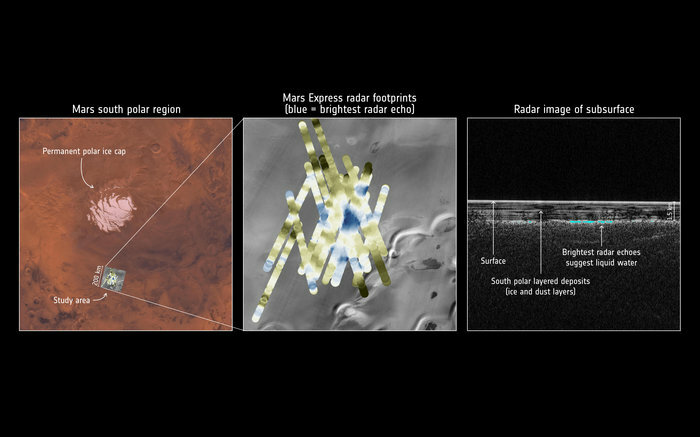 The Mars Express spacecraft probing the southern hemisphere of Mars. Credit: ESA/INAF/Davide Coero Borga. Last week scientists announced that they have found signs of existing water on Mars, offering new hope to the possibility of uncovering life on the Red Planet’s subsurface. 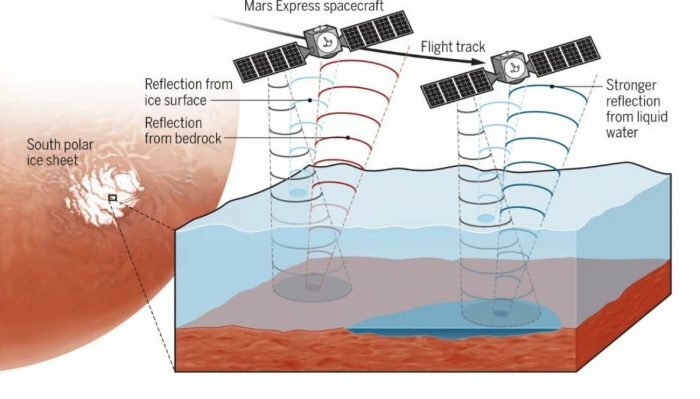 Radar observations made by the European Space Agency’s Mars Express satellite, suggest that a liquid lake is buried 1.5 kilometres beneath an ice cap situated near the south pole of Mars. Scientists think that this body of water is likely a few metres deep and 20 kilometres across, “nearly three times larger than the island of Manhattan,” reported Scientific American. 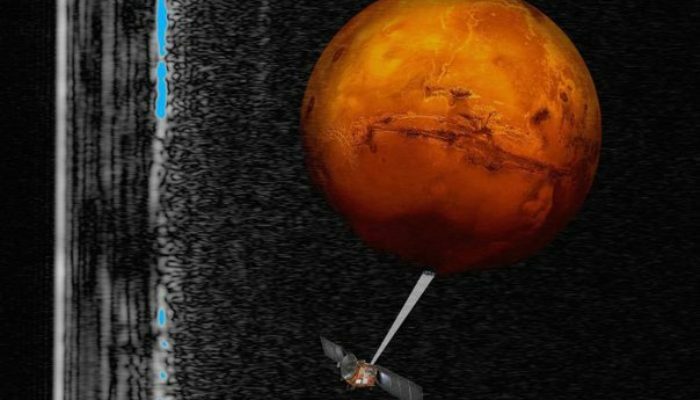 For the last 12 years the Mars Express satellite has been taking measurements of Mars by sending beams of radar pulses into the planet’s immediate interior. 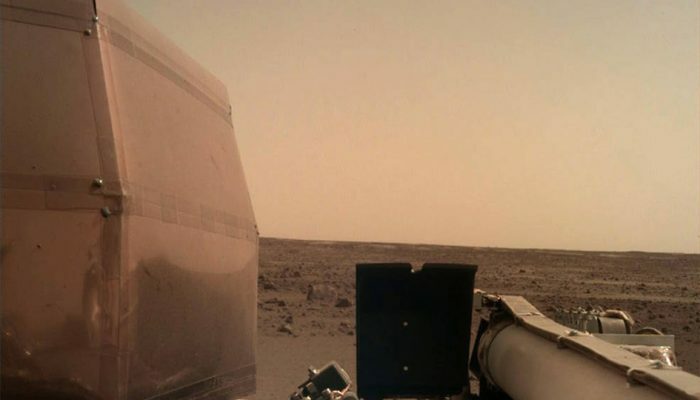 As these waves bounce back, the brightness of the reflection gives information on the material lying beneath Mars’ surface. The researchers involved came across this discovery while analysing three years worth of data collected by the spacecraft. “The bluer the colors, the brighter the radar reflection from the material it bounced off. The blue triangle outlined in black in the middle is the purported lake,” reported Science News. 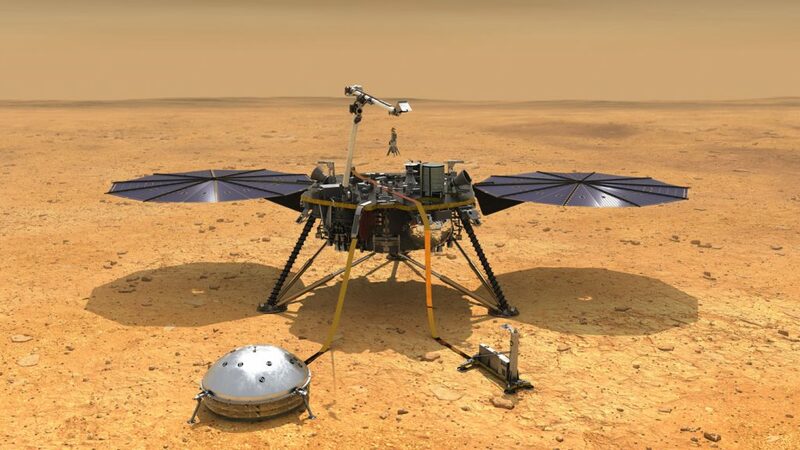 Previous observations, made by NASA’s Curiosity rover for example, have found lake beds on the planet’s exterior, signifying that water may have flowed on Mars in the past. However, if this new finding is confirmed, it would be the first discovery of an existing stable body of water, one of the conditions believed to be necessary for life to thrive. In other news, the two words best describing the northern hemisphere this summer could very well “hot” and “dry,” as a series of heat waves have taken hold of several regions across Europe, Asia, North America and northern Africa. Many countries this month, including Japan, Algeria and Canada, have even experienced record-breaking temperatures. For some places, above average temperatures and dry conditions have helped fuel devastating wildfires. 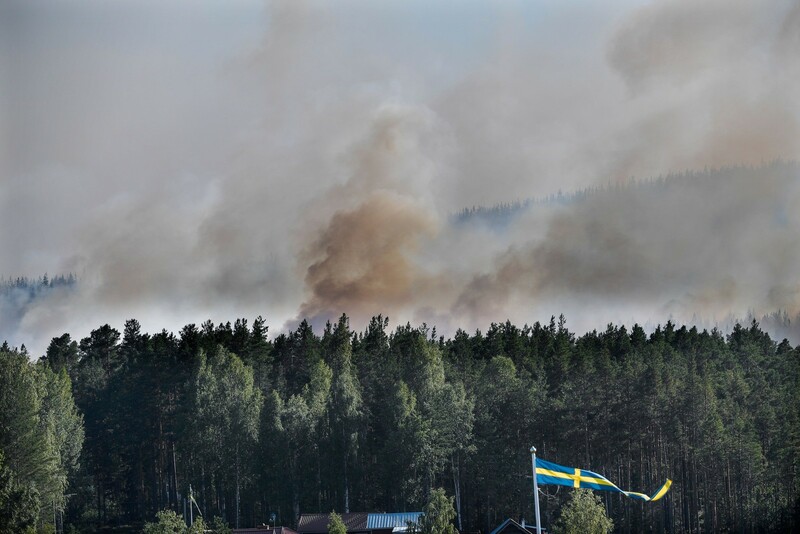 More than 50 wildfires have swept through Scandinavian forests this summer, many well within the Arctic Circle, causing Sweden to request emergency aid from nearby countries. A major wildfire also ignited near Athens, Greece this month, resulting in more than 85 death, with dozens still missing. While Greek officials claim that there are “serious indications” that the flames were brought upon by arson, they also note that the region’s climate conditions were extreme. To many scientists, this onslaught of hot and dry conditions is a taste of what may soon become the norm. Of course, these conditions (in Europe, for example) are partly due to weather. 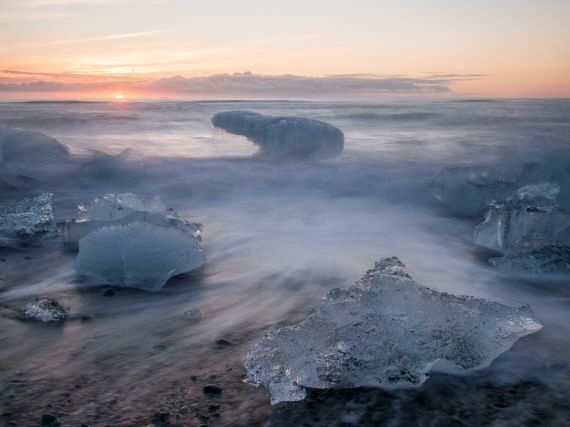 “The jet stream – the west-to-east winds that play a big role in determining Europe’s weather – has been further north than usual for about two months,” reports the Guardian, leading to sweltering conditions in the UK and much of Europe, while leaving Iceland cool and stormy. However, scientists say that heatwaves in the northern hemisphere are very much linked to global warming. “There’s no question human influence on climate is playing a huge role in this heatwave,” said Myles Allen, a climate scientist at the University of Oxford, to the Guardian in the same article. A recent assessment on the ongoing heat wave in Europe reports that these conditions are more likely to occur due to climate change. “The findings suggest that rising global temperatures have increased the likelihood of such hot temperatures by five times in Denmark, three times in the Netherlands and two times in Ireland,” said Carbon Brief. Geologists have given a name to Earth’s most recent chapter: Meghalayan Age. The announcement was made earlier this month when the International Union of Geological Sciences updated the International Chronostratigraphic Chart, which classifies Earth’s geologic time scale. The new update has divided the Holocene Epoch (the current time series which began 11,700 years ago, when the Earth was exiting its last ice age) into three stages: the Greenlandian, the Northgrippian, and then Meghalayan. The Meghalayan Age represents the time between now and 4,200 years ago, when a mega-drought led to the collapse of many civilisations across the world. The middle phase, Northgrippian (from 8,300 years ago to 4,200 years ago), is marked by an sudden cooling event brought on by massive glacial melt in Canada that affected ocean currents. Finally the oldest phase, Greenlandian, (from 11,700 years ago to 8,300 years ago) is marked by the end of the last ice age. The recent update has created some unrest in the geosciences community. “There is still an active debate about assigning a new geologic slice of time to reflect specifically the influence of humans on the planet,” reported BBC News. Some scientists say that the new divisions conflict with the current work being done on proposing a new epoch classification, famously called the ‘Anthropocene,’ which would be marked by the beginning on significant human impact on Earth’s geology and ecosystems. Does soil really affect wine’s flavour? : The idea that a vineyard’s soil lends a wine its flavour is becoming increasingly popular – but is there any scientific basis? This month we released not one but two press releases from research published in our open access journals. The findings from both studies have important societal implications. Take a look at them below. The Baltic Sea is home to some of the world’s largest dead zones, areas of oxygen-starved waters where most marine animals can’t survive. But while parts of this sea have long suffered from low oxygen levels, a new study by a team in Finland and Germany shows that oxygen loss in coastal areas over the past century is unprecedented in the last 1500 years. The research was published in the European Geosciences Union journal Biogeosciences. An international team of scientists has shown how much sea level would rise if Larsen C and George VI, two Antarctic ice shelves at risk of collapse, were to break up. While Larsen C has received much attention due to the break-away of a trillion-tonne iceberg from it last summer, its collapse would contribute only a few millimetres to sea-level rise. The break-up of the smaller George VI Ice Shelf would have a much larger impact. The research was published in the European Geosciences Union journal The Cryosphere. NASA scientists have revealed surprising new information about Jupiter’s magnetic field from data gathered by their space probe, Juno. Unlike earth’s magnetic field, which is symmetrical in the North and South Poles, Jupiter’s magnetic field has startlingly different magnetic signatures at the two poles. The information has been collected as part of the Juno program, NASA’s latest mission to unravel the mysteries of the biggest planet in our solar system. The solar-powered spacecraft is made of three 8.5 metre-long solar panels angled around a central body. The probe (pictured above) cartwheels through space, travelling at speeds up to 250,000 kilometres per hour. Measurements taken by a magnetometer mounted on the spacecraft have allowed a stunning new insight into the planet’s gigantic magnetic field. They reveal the field lines’ pathways vary greatly from the traditional ‘bar magnet’ magnetic field produced by earth. The Earth’s magnetic field is generated by the movement of fluid in its inner core called a dynamo. The dynamo produces a positive radiomagnetic field that comes out of one hemisphere and a symmetrical negative field that goes into the other. The interior of Jupiter on the other hand, is quite different from Earth’s. The planet is made up almost entirely of hydrogen gas, meaning the whole planet is essentially a ball of moving fluid. The result is a totally unique magnetic picture. While the south pole has a negative magnetic field similar to Earth’s, the northern hemisphere is bizarrely irregular, comprised of a series of positive magnetic anomalies that look nothing like any magnetic field seen before. Before its launch in 2016, Juno was programmed to conduct 34 elliptical ‘science’ orbits, passing 4,200 kilometres above Jupiter’s atmosphere at its closest point. When all the orbits are complete, the spacecraft will undertake a final deorbit phase before impacting into Jupiter in February 2020. So far Juno has achieved eleven science orbits, and the team analysing the data hope to learn more as it completes more passes. “In the remaining orbits we will get a finer resolution of the magnetic field, which will help us understand the dynamo and how deep the magnetic field forms” explains Scott Bolton, Principal Investigator of the mission. 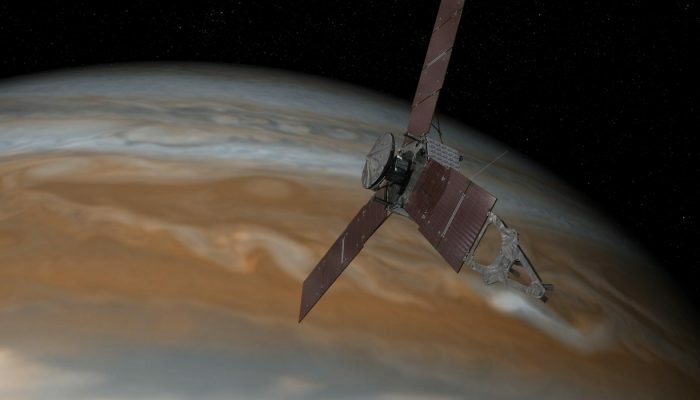 The researchers’ next steps are to examine the probe’s data after its 16th and 34th passes meaning it will be a few more months before they are able to learn more of Jupiter’s mysterious magnetosphere.